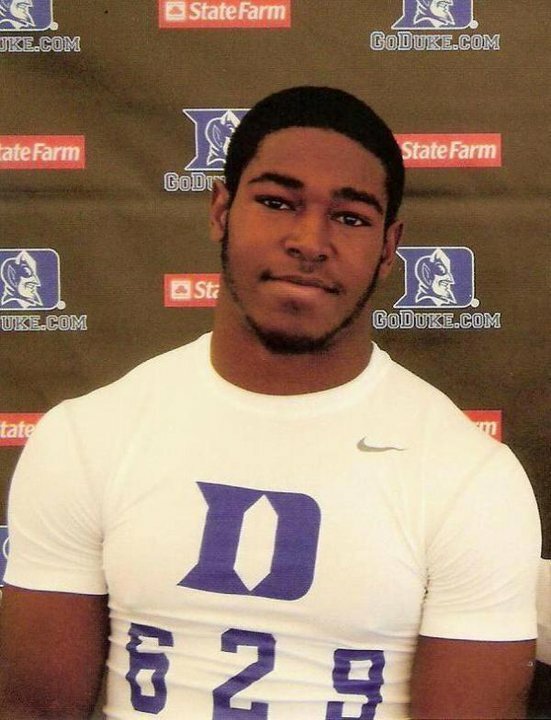 In 2010, Duke coaches and fans were impressed by the play of freshman linebacker Kelby Brown. On the recruiting trail, the Duke coaching staff is searching for more hard-hitting linebackers to join Brown on the Blue Devil defense. Keilin Rayner is a 6’3” 220 pound linebacker prospect from Leland, North Carolina. As a junior, Keilin played primarily defensive end, helping North Brunswick HS to the state playoffs and a 5-7 overall record. Highlights from his junior year can be viewed here. BDN: Can you start out by describing your strengths as a player? I guess my speed for my size, be able to get off blocks and go back side and get to the ball. My agility is one thing, my agility and my ability to get off the ball, speed to get off the ball. BDN: What are your goals for your senior year? Get a lot of tackles, pretty much. BDN: What are the most important factors you’re looking for in a college? Pretty much the facility, the fans, and the tradition for winning, like trophies and such. BDN: Which schools have you heard the most from so far? Who were the first schools to contact you? I got my first offer from ECU, it was like the end of my sophomore year, and I’m talking to Duke and Clemson – I talked to the Florida coach he called the other day. BDN: Which schools have you had a chance to visit so far? Yeah, I went to Duke, ECU, pretty much been around the state, haven’t been out of state. BDN: Have any schools stood out to you at this point in the process, either on your visits or your contact with coaches? Yeah, Duke and [NC] State. [NC] State’s facilities specifically appear top notch, and Duke pretty much you can get a degree, pretty much worldwide, from an educational standpoint with Duke. BDN: Do you have plans to visit any other schools this spring or summer? Maybe South Carolina, or Virginia Tech. BDN: At this point in the process, do you have an idea for when you would like to make your college decision?